Thanks to Jonas Nockert for sharing this one. The instant I saw it, the image struck a chord, both introspectively and as a commentary on broader society today. Below I have reproduced the most recent cover of the New Yorker, posted by Design Milk, which says a lot about today’s society. Something of which I know I’m guilty – my face constantly being lit up by a screen of some sort. It is also something which I’ve seen in action at the last stadium concert I attended – the view from the stand seats being one of a sea of camera phones held up to capture the moment, either calling friends during famous songs, or camera-phoning the event. This humorous new cover for the November 2, 2009 issue of The New Yorker says a lot more than it appears to at first glance. For a closer look in case it’s difficult to see, read more. 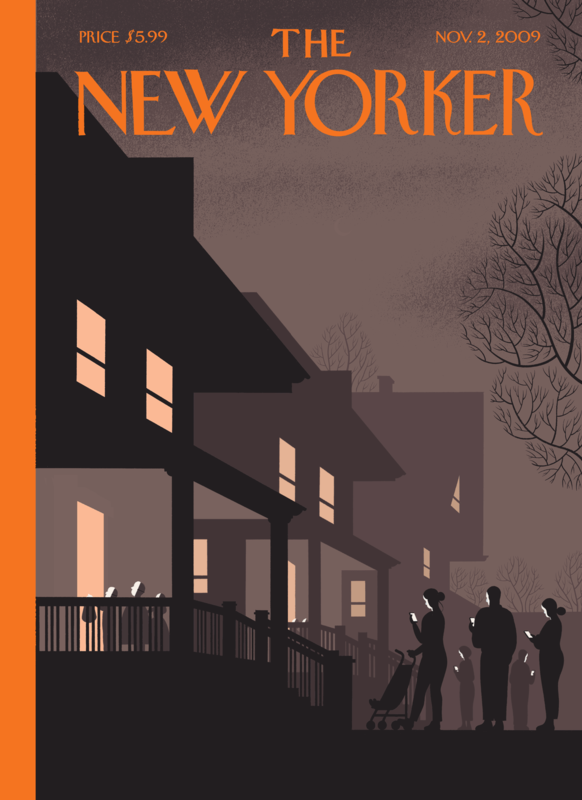 via Design Milk – The New Yorker Cover by Chris Ware. This cover also made me think of one of the best articles I’ve read on TechCrunch in a long time – NSFW: Weezer, plane crashes and everything else that’s worrying about the real-time web – which I recommend reading, and captures a lot of my own thoughts and concerns about the all-encompassing, always-on, realistically unsocial (at least in the traditional sense) internet world into which we’re drifting. Am I guilty of a lot of these things – hell yes. My world is now driven by internet-based communication and social networking tools, I’m as bad as anyone. Still, I want to keep it in check and make some changes that result in me having a bit more physical world interaction over the coming years. I think travelling to India and Cambodia will help with this. Maybe I’m wrong and it’s just a natural evolution, but I still think I need to keep it in mind. Anyway, great cover – wanted to share it out there (I recognise the somewhat ironic nature of using the medium I am slightly knocking to deliver this message).